Communication is essential for all relationships. It is the way we connect with others, the way we explain our needs, wants, values, concerns, fears, and dreams. Poor communication results in misunderstandings, unmet expectations, and conflicts. Healthy communication leads to cooperation, mutual understanding and intimacy. We learn to communicate at a very young age. We develop different communication styles based on our personality and our experiences, and we develop communication skills that facilitate the style that works best for us. 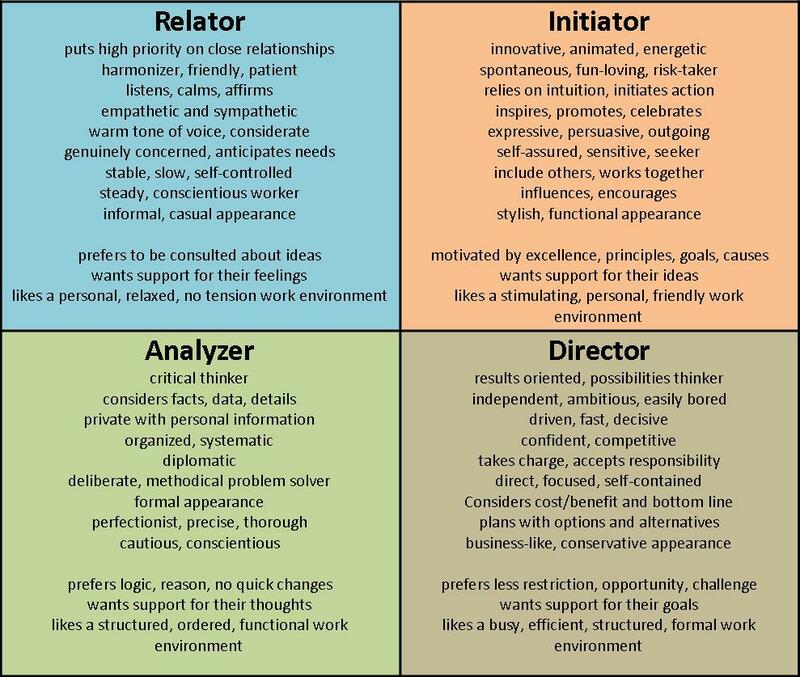 This week I learned about a Communication Style Model that identifies four different communication styles. The study explains that we develop a primary style that we use most often, and sometimes we employ a secondary style if the primary isn’t working well or we are under stress. The study also describes how we can interact better with others who use a style different from ours. Can you identify your primary style? Each style has important inherent strengths, but none is complete by itself. There is much to appreciate in each; we are better when we have all styles working together. When we communicate with a person whose style is different from ours, it is helpful to match their style and pace as much as possible. Those who can adapt and flex to other’s values and preferences will be more successful in communication. This communication model has helped me understand what others in my family and workplace might need or prefer. I hope I can apply some of what I have learned to our future conversations. What have you learned from this model? How can you adapt your style to better communicate with someone important to you? You might also like to read: how are your listening skills? or asking powerful questions or questions for a destination. This entry was posted in learning and leading, life, team and tagged communication skills, communication style, healthy communication, understanding by terry morgan. Bookmark the permalink. You can take a free communication style survey at http://www.communication-styles.com It takes less than 4 minutes! Thanks, Terry. I see myself in the top two, my husband in the bottom two. Somehow we have learned to communicate well. Yes, you have… and you are a great example to many!